I have always loved the product Shoe Goo. I put it over the stitching on interference boots besides using it on my own shoes to make them last longer. Yes I am a cheapskate. 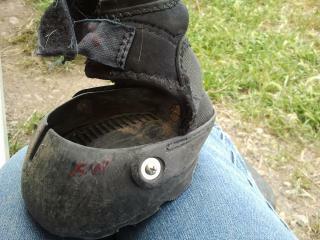 Shoe Goo protects the stitching on the interference boots as the dirt, sweat and elements tend to destroy the thread. So when I was looking at some Easyboot Glove gators recently with worn stitching, loose threads and weakened areas I had an aha moment and remembered the Shoe Goo. I bet Shoe Goo would help me get more life out of these gators, and I try to squeeze every bit out of them anyway. 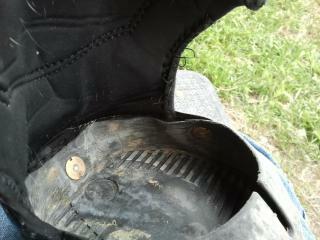 Note the loose threads at the curve of this boot, they need sealed up or restitched while it is still in good shape. This curve takes a lot of wear and needs to be protected in order to have a longer useful life. 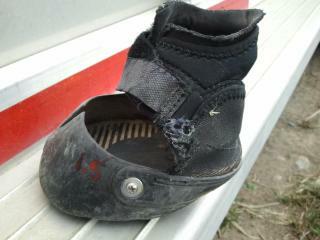 This boot has more than loose stitches: the little black band has now become loose. So I first cut out the bad pieces and threads. 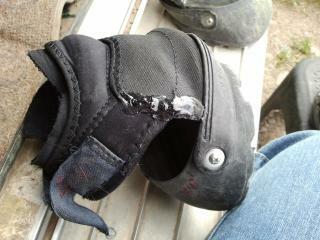 Then I squeeze the Shoe Goo out of the tube onto the area that needs mending or protected. You can buy Shoe Goo at just about any store that sells shoes, it’s usually hanging on a hook at the end of an aisle and just ask for it. It costs a whopping $4. Now I know it looks gooby and lumpy, but just let it set for about 10 – 15 minutes. After it has started to cure, the outside is no longer tacky and you can squeeze it around and smooth out all the edges. It will still have a bit of a poofy appearance. But after several hours it lays flat and has no hard edges and voila! Your boots are fixed, seams are sealed and they don’t rub.